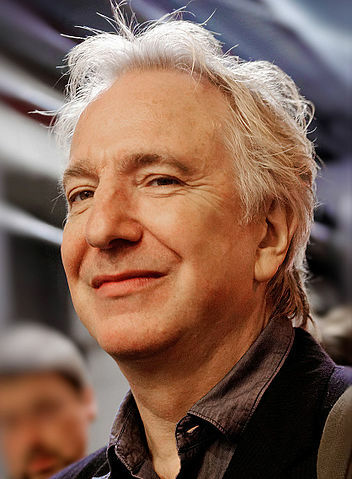 Alan Rickman was born in Hammersmith, London, England, on February 21, 1946, was an English actor. Young Alan Rickman began his acting career on stage at the Royal Court Theatre. Rickman's breakthrough performance came as the Vicomte de Valmont in a play Les Liaisons Dangereuses (1985), for which he was nominated for a Tony Award. He made his big screen debut in action film Die Hard (1988) in role as Hans Gruber. He won the BAFTA Award for Best Actor for his role as Sheriff of Nottingham in romantic action adventure film Robin Hood: Prince of Thieves (1991). He won a Golden Globe Award and an Emmy Award for his role as Grigori Rasputin in biographical historical drama television film Rasputin: Dark Servant of Destiny (1996). He studied graphic design at Chelsea College of Art and Design and at the Royal College of Art. He voiced Absolem in films Alice in Wonderland (2010) and sequel Alice Through the Looking Glass (2016). He was in a relationship with Rima Horton since 1965, they were married in 2012 . He was godfather to British actor Tom Burke. He wore black contact lenses for his role of Professor Severus Snape. Good friends with Adrienne Clarkson and Sharman Macdonald. Rickman died on January 14, 2016, London, England, at age of 69. I never talk about 'Harry Potter' because I think that would rob children of something that's private to them. I think too many things get explained, so I hate talking about it. Any actor who judges his character is a fool - for every role you play you've got to absorb that character's motives and justifications. It's a great pleasure to me to work on film now as well as on the stage. But it is no soft option. It isn't easier. It's in many ways more difficult, and it's a different kind of a challenge. You have to think a lot quicker and be a lot more immediate. I don't play villains, I play very interesting people.